Dolby demoed its Dolby ProLogic IIz technology today at CES and TechRadar was given a sneak audio peak of just how the company's new 9.1 setup will sound. To get the full audio effect, two new front-height speakers will need to be installed into your home. The speakers, situated above left and right of your usual 7.1 speaker setup, enhance your viewing experience, adding extra depth to movie and videogame sound and music listening. The demo we saw was from a first-person war game, where helicopter gunfire from above sounded ultra-realistic. 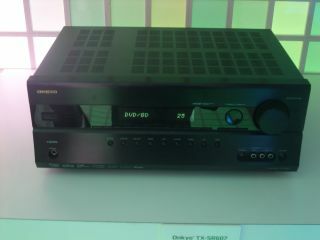 The first receiver to be able to handle Dolby ProLogic IIz is the Onkyo TX-SR607. The 607 is the successor to Onkyo's hugely popular £400 machine, the TX-SR606. If you only have a 5.1 setup, then the Dolby ProLogic IIz can be used to create 7.1 surround.